Heat oven to 350°F. Place paper baking cup in each of 80 miniature muffin cups. In large bowl, beat Cupcake ingredients with electric mixer on low speed 30 seconds, then on medium speed 2 minutes, scraping bowl occasionally. Divide batter evenly among muffin cups, filling about three-fourths full. Bake 10 to 12 minutes or until toothpick inserted in center comes out clean. Cool 5 minutes; remove from pans to cooling rack. Cool completely, about 30 minutes. Just before serving, spread about 1 teaspoon whipped topping on each cupcake. Arrange 70 cupcakes on tray as shown in photo. 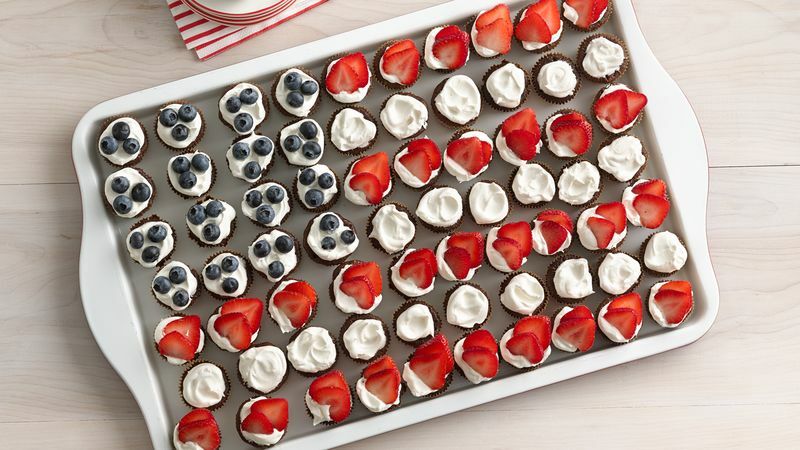 Place blueberries and strawberries on cupcakes to make stars and stripes pattern as shown in photo. Serve remaining cupcakes on another plate. Store in refrigerator. Once decorated, these cupcakes will need to be stored in the refrigerator. But you can make these cute little cupcake gems another time and freeze them, unfrosted, to pull out for a special treat!